In Defense of the Bible gathers exceptional articles by accomplished scholars that address and respond to the major contemporary challenges to the divine inspiration and authority of Scripture. Textual and historical challenges and how to deal with them comprise the second section and address straightforwardly-charges that the Bible has been corrupted beyond repair, questions concerning authorship, The Bible's alleged use of pagan myth, and the historical reliability of the Old and New Testaments. Lastly, final chapters, take on ethical, scientific, and theological challenges and demonstrate the Bible's moral integrity in relationship to modern moral emphases, that science can be harmonized with biblical teaching, that the Christian Canon is more than a result of mere politics, and further establishes that the Bible is the inspired and authoritative word of God. In Defense of the Bible is an important work that should be considered and studied by all hold the Bible to be God's inspired word. In a time when attacks on the Bible come from both within and outside of evangelical ranks, this book is a timely and needed resource to help us see with clear eyes. In Defense of the Bible gathers exceptional articles by accomplished scholars (Paul Copan, William A. Dembski, Mary Jo Sharp, Darrell L. Bock, etc. ), addressing and responding to all of the major contemporary challenges to the divine inspiration and authority of Scripture. The book begins by looking at philosophical and methodological challenges to the Biblequestions about whether or not it is logically possible for God to communicate verbally with human beings; what it means to say the Bible is true in response to postmodern concerns about the nature of truth; defending the clarity of Scripture against historical skepticism and relativism. Contributors also explore textual and historical challengescharges made by Muslims, Mormons, and skeptics that the Bible has been corrupted beyond repair; questions about the authorship of certain biblical books; allegations that the Bible borrows from pagan myths; the historical reliability of the Old and New Testaments. Final chapters take on ethical, scientific, and theological challenges demonstrating the Bible's moral integrity regarding the topics of slavery and sexism; harmonizing exegetical and theological conclusions with the findings of science; addressing accusations that the Christian canon is the result of political and theological manipulation; ultimately defending the Bible as not simply historically reliable and consistent, but in fact the Word of God. Steven B. Cowan is the Jim Young associate professor of Philosophy and Religion at Louisiana College in Pineville, Louisiana. Cowan and Wilder have amassed a stellar team of contributors who [have produced] a book that is at once deep in coverage and wide in scope. This is an authoritative treatment of biblical inspiration and inerrancy, and I highly recommend it. 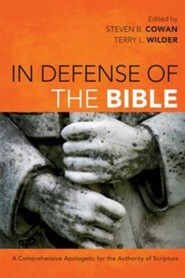 'In Defense of the Bible' is an impressive, important, and timely collection of serious essays, providing a faithful apologetic for the truthfulness of holy Scripture. Steve Cowan and Terry Wilder are to be commended for assembling a fine group of authors who have offered well-informed, readable, and engaging presentations that will be both helpful and hopeful for students and church leaders alike. This timely volume addresses nearly every significant area of dispute on the authority of the Bible, thus repaying its reader with an increase in knowledge concerning 'the living and active' Word of the living God (Hebrews 4:12). Carefully argued, meticulously documented, and lucidly and creatively written, 'In Defense of the Bible' should be read by every pastor and student, believer and skeptic, who are concerned about truth--the truth about God, the truth about the Bible, and the truth about ourselves. I'm the author/artist and I want to review In Defense of the Bible - eBook.